Tnank you for your interest in our product, we work for your satisfaction. We have greatest deals on 2-way radios and accessories! The Motorola Talkabout® MT350 series is the recommended choice when it comes to battery life performance. It has up to twice the amount of battery life than compared to the standard Ni-MH rechargeable battery pack. With a range of up to 35 miles, its perfect for active outdoor excursions or lifes every day adventures. Take a pair on your next hunting, camping or hiking trip and stay connected in any season. EXTENDED LIFE BATTERIES Enjoy hours of uninterrupted outdoor activities. The MT series provide maximum battery life in a small package and is designed to withstand hours of extended usage providing users with up to 15 hrs of talk time. WEATHERPROOF The MT series flaunts its weatherproof ID design making it ideal for protection not only from dust, but from wet weather conditions be it snow or rain splashes. Its emergency alert feature, built-in LED flashlight and NOAA weather alert channels provide a total emergency preparedness communication solution. TALKABOUT CLEAR Boasting a high efficiency class D amplifier, the MT series radio delivers enhanced sound quality by reducing distortion at high volumes. EXTRA POWER WHEN YOU NEED IT MOST Push-To-Talk Power Boost, when activated, allows you to extend the transmission range by increasing the transmitter power output while saving battery life when no power boost is necessary. HANDS-FREE COMMUNICATION When you are hiking up a steep mountain trail, you really need to keep your hands free to brace the rocky terrain. With iVOX acting like a speakerphone and allowing hands-free communication, you can keep on moving without stopping to answer a call. Items Included: 3 Radios, 3 NiMH rechargeable battery packs, 3 mini-USB chargers, manual. Wall chargers will work with any power 110-240V 50-60HZ. EASY CHARGE Designed to fit every lifestyle, the MT350 allows you the convenience of charging many distinct ways. Use the provided mini-USB charger for portable convenience, great for charging at home or to take along to recharge in a hotel. While on the go, you can use our mini-USB car charger. SILENT SIGNALS The VibraCall silent vibrating ringer is especially useful for locations where ringing can be intrusive. This feature is also great when noise from a sporting event would drown out your ring tone. ECO SMART The collective energy wasted in powering handheld electronics has become a Global issue. Most of the energy wasted while charging a mobile device occurs within the charge. On an individual basis, the amount of energy wasted per year is negligible. However, there are hundreds of millions of chargers in use today. The largescale incorporation of energy efficient chargers benefits the planet both economically and environmentally. The MT series does its part by using the latest technological design to produce a high efficiency wall adaptor which consumes one half watt of power during idle conditions. THIS MODEL IS NOT WATERPROOF. THE ONLY WATERPROOF MODEL - MOTOROLA MS350. What are the key points you need to look when choosing 2-way radio. Choose a two-way radio that will operate at needed distances, using higher wattage as the best indicator of transmission range. Remember that ranges are based on direct line of sight measurements, so buildings and natural features will reduce the usable range. Family Radio Service (FRS) radios allow for up to two miles of transmission, do not require a license and work right out of the box. General Mobile Radio Service (GMRS) radios have more range and channels and require all users to obtain an FCC license before they begin transmitting. Spending more will get you a two-way radio with more channels, which may be needed in densely populated areas. Look for dual-channel monitoring or channel scan for easier communications with multiple two-way radios and try to find a model that monitors weather and emergency channels. Better two-way radios use privacy codes that will keep outside conversations off your channel and scramble your conversations to keep eavesdroppers from hearing them. For business applications where privacy is essential, consider leasing a private channel and getting two-way radios that can use it. Most families will be happy with replaceable batteries for home use and occasional outings. Daily two-way radio users should look for kits with rechargeable batteries that can be refreshed in a docking station. Please visit our store for more great DEALS. In the event 2wayRus provides a repaired or replacement part, telephonic technical assistance will be provided. 2wayRus reserves the right to substitute functionally equivalent new, used or serviceable reconditioned parts or Systems. Now you won't have to worry about unexpected repair and service costs. It cover Parts and Labor for the entire term of the plan - and a no lemon policy guarantees if your item breaks more than 3 times, it will be replaced for free. Defective equipment will be covered by applicable warranties. We welcome any questions or comments you may have. We work very hard to resolve ALL issues to our clients satisfaction. YOUR SATISFACTION IS OUR GOAL!! We test every single item to make sure that you can rely on us! 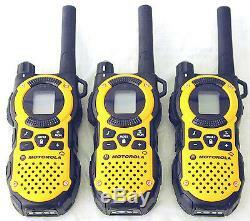 The item "3 Motorola MT350R FRS GMRS 2-WAY Radio Walkie Talkie Ni-MH Weather VOX Vibracall" is in sale since Monday, July 08, 2013.